A performance of Trial by Jury in 1912 as part of one of music master Percy Godfrey’s concerts was a one-off and there were concert performances of HMS Pinafore in 1934 and Iolanthe in 1935, but in the 1950s a tradition of Gilbert and Sullivan started. The first show was HMS Pinafore in the Chapter House in 1955. 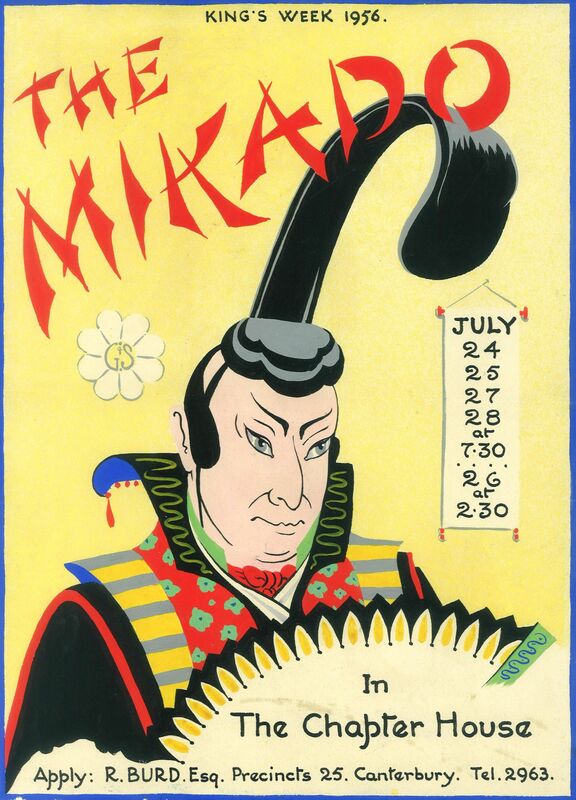 Over the next twenty years, under the musical direction of Edred Wright, there were performances of The Gondoliers, Iolanthe, The Yeomen of the Guard, Patience, Ruddigore, HMS Pinafore again, The Mikado (twice), and The Pirates of Penzance. It was no coincidence that Judy Garland’s last film I Could Go On Singing (1963), directed by King’s School parent Ronald Neame and partly filmed in the Precincts, included scenes of the heroine watching a performance of HMS Pinafore at her son’s school. The arrival of girls in the 1970s meant that the three little maids from school were now sopranos and not trebles, and in 1977 a production of Oliver! (the film of which had earned OKS Carol Reed his Oscar as Best Director in 1968) broke the G & S monopoly. Since then, there has been the occasional Savoy Opera, notably in King’s Week 1996 when The Pirates of Penzance marked the final term of Cornish Headmaster Anthony Phillips. House plays sometimes ventured in a musical direction, for example with a superb version of The Pirates of Penzance in 1991 from School House, Galpin’s and Broad Street Radigunds. After a lull in the early 2000s, musicals have returned with a vengeance. The 2007 Les Misérables, in what we must now call the old Marlowe, was a spectacular success and it was followed in 2009 by an equally dazzling Cowardy Custard in a transformed Shirley Hall. West Side Story (2012) in the new Marlowe Theatre was the latest in this fine tradition.